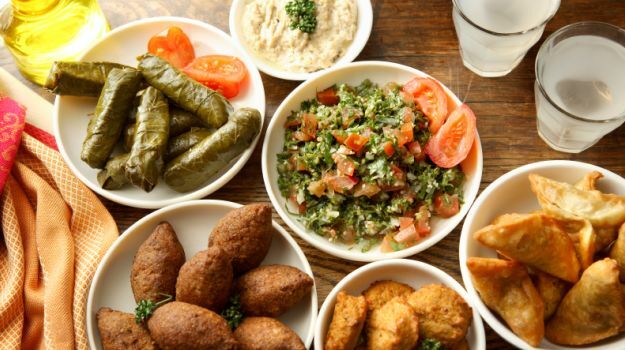 Beyond Hummus: 9 Popular Arabic Foods You Must Try - Integration Through Media ....! The question of who exactly are the Arabs and what exactly is their cuisine is a question simpler to ask than answer. The Arab identity is a complex notion. Politically speaking, the “Arab world” connotes the 22 Arabic speaking nations of the Arab League. 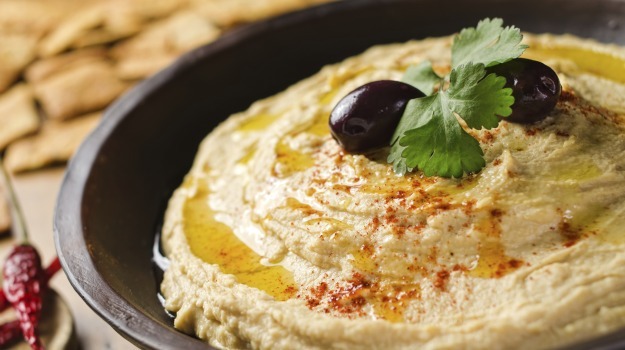 But if you go beyond this relatively new 19th century phenomenon of Arab nationalism, you will Beyond Hummus: 9 Popular Arabic Foods You Must Try how multilayered the notion is. People from regions spread across Africa, the Mediterranean and West Asia may be bound by a common language and religion, but there are also indigenous ethnicities at play. And when it comes to food, this question of what exactly is Arab food becomes even more complicated. 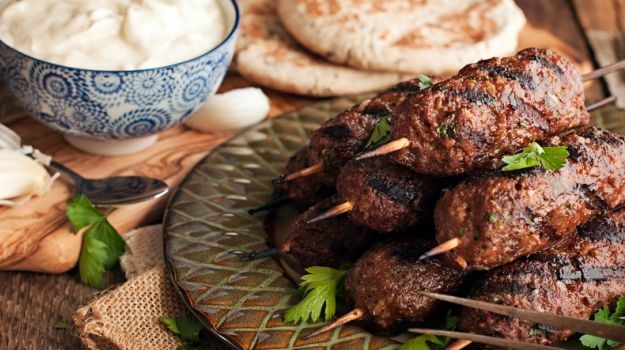 Despite similarities, Arabic cuisine is hardly a single entity. Instead, it is made up of many different regional foods and what you eat on the Atlantic or Arabian coast may be pretty distinct from what you would eat in the desert.What you cannot discount, however, on all these various foods is the impact of the Ottoman Empire than ruled such a major chunk of the world at its zenith, including most of the countries now recognized as part of the Arab world. The Turkish influence is, of course, equally evident in cuisines such as Greek and Indian, and throughout our histories there has been a steady exchange of ingredients, cooking methods and ideas, which have shaped all these cuisines. Arab Influences on Indian CuisineThe Ottoman culture, including its food culture, was in turn influenced by the highly refined culture of the Persian Empire, which has also impacted the food traditions of India. Much of the Mughal-based court cuisines in the Subcontinent are a direct result of the intermingling of ideas and ingredients, and we can see a distinct journey from the Persian/Turkish traditions to their further transformation in India, as things like the pulao, kofte, kebab and indeed the sambusak/samosa came in contact with Indian spices and inventiveness.If you travel the Arab world today, much of the food as well as the larger culture of eating will not seem utterly alien to you precisely because of this reason. The shared heritage means that there are familiar elements everywhere-the kefta may be less spiced than our kofte, the sambusak may be made of a filo casing, not a maida one and, of course, the chunks of meat that pass off as “kebab” in that world may be completely different from the many different refined ones in India. But we can quite clearly recognise them as belonging to the same family.What is also instantly recognisable is the legacy of hospitality and generosity. The Arabic world largesse when it comes to a lavish table and the sharing of bread with guests is of paramount importance. In India, this idea of shared eating, of the sanctity of sharing salt with kinsmen and guests became a part of our larger culture via the Arab/Ottoman world. If “namak halal”, being loyal to one whose salt you have eaten, has been such a big part of the Indian feudal psyche, it is precisely because of the connections of those past centuries. 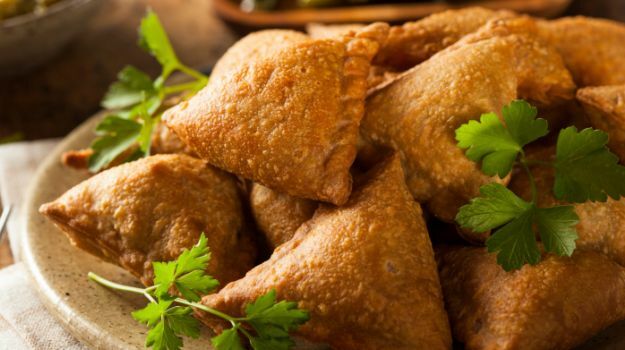 9 Popular Arabic FoodsThe Arab influence in Indian cuisines, of course, didn’t just seep in as a result of courtly interactions with the Ottoman culture. The Arab tribes of West Asia were always adventurous, the first traders of the world, who really held the key to the trade between the east and the west. The trade in expensive ingredients – spices, saffron and so on – from India and China to Europe was often controlled by them though European maritime powers finally wrested that control, leading to the rise of Colonialism.But for centuries prior to that, it was the Arabs who navigated the seas, taking our zero to the world as also pepper, settling on the southern and western coasts, and giving rise to flavour foods that we prize even today – the Moplah Biryani of Kerala is just one of those as is the glutinous Khozikode Halwa.So what are the dishes that you can eat in the Arabic World? Here’s a list -1. Khubz: This is the Arabic flatbread quite like the pita that you will find throughout the region, wherever you go. It is thick and traditionally baked in a tannur (from where our own tandoor perhaps originated, as well as the tradition of tandoori breads). You can eat it with hummus and grilled meats.2. Kefta: The predecessor of the Indian kofta, the kefta is simply a grilled dish of ground meat like lamb or beef. It is mildly seasoned with paprika, parsley and sometimes onions and grilled like a seekh kebab. Unlike the Indian kofte, don’t expect a gravy. 3. Tahini: Made from sesame seeds, which are hulled, toasted and ground, this is a paste that is essential to all Mediterranean as well as much of Arabic food. It’s a condiment that goes into everything – from your dips like babaganoush (made from aubergines) and hummus (made from ground chickpeas) that are part of any mezze (sharing portions, almost like an aperitif) to even some types of halva. 4. Labneh: Yoghurt is perhaps as popular in the Arab world as in India. The labneh is a creamier version with the water drained out. 5. Mansaf: This is Jordan’s national dish but also found in countries like Iraq and Saudi Arabia. Originally meaning a “large tray”, the version of the dish now served is with lamb that is cooked in a jameed broth. Jameed is a sort of cheese made from fermented yoghurt. The dish is served on a large platter with a flatbread that is topped with white rice, layered with meat, garnished with almonds and pine nuts and then topped with a creamy jameed sauce. This is a dish for feasts. 6. Tagine: This is traditionally a North African tribal dish that you can find in places such as Morrocco, Algeria and Tunisia. It takes its name from the pot in which the dish is cooked. The tagine is a typical pot with a conical top in which meats and vegetables are cooked together. Unlike in a stew where water/broth is added, here the liquid that is part of the dish comes from the ingredients themselves. The vapour is retained in the pot and condenses into it. In that sense, this is almost like dum cooking in India, where food is cooked in its own juices. 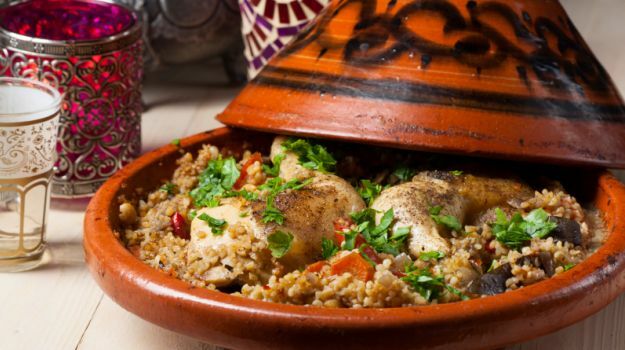 A tagine is eaten with couscous, a form of semolina that functions as an alternative to rice. 7. 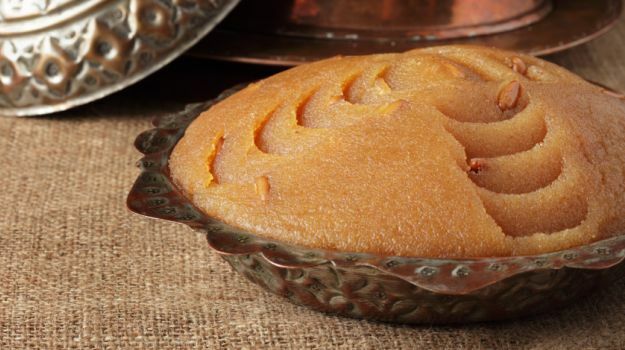 Kunafeh: It is a dessert found in many regions of the Arab world. It is like a version of cheesecake. It is made from semolina dough and thin noodle-like phyllo pastry. It is stuffed with a white soft cheese such as Nabulsi. It is crunchy from the outside but soaked in syrup. 8. Halva: In Arabic, halva just means a sweet confection. The term refers to dense sweets that can be grain-based (like made with wheat, which are glutinous and spongy in texture, or semolina). But the Arab world halvas can also be nut based-these use tahini paste or other nut butters and sugar. 9. Arabic tea and coffee: Al Qahawa or the Arabic coffee is a ritual in itself. It is usually made with the addition of some cardamom, served in small cups without handles and always with dates. If you are eating in a restaurant, it is always served complimentary with the meal. 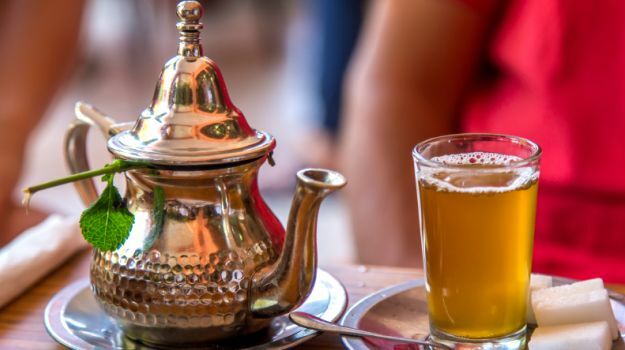 The Maghrebi mint tea is common in the Berber areas-Morocco, Algeria, Tunisia, Libya… But it has spread to other parts of the Arab world too. Green tea is made with the addition of mint leaves. It can be fairly ceremonial-the tea is always offered by the head of the household to the guest and at least three glasses are offered. It is impolite to refuse.